Magnum Lynx 8.0 boot – A new era for Magnum? Magnum have released a new range of boots. They are called the Magnum Lynx boots. 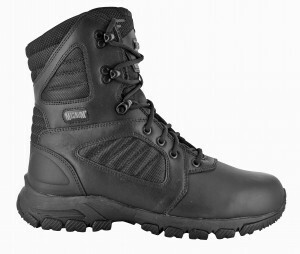 The Magnum Lynx boot is a modern patrol boot. In this post I am going to be talking about the Magnum Lynx 8.0 boot in particular. This a fresh approach from Magnum and from what we have seen so far we like it. This boot has a very modern look to it. The boot is made from leather and nylon. Most of the boot is leather to keep the professional look to it. The nylon is at the top and side of the boot. The sole looks very durable and tough. It looks very solid this is good as the sole of a boot is very important. The nylon is made in a way that makes it look a bit like carbon which I think is cool and gives the boot a very nice finish to it. I know in the Police world cool counts for nothing but you should like the boots you wear as you have to pay for them. I think this boot is one of Magnums better looking boots. Like all Magnum boots this boot is full of specification but does not come with the massive cost. 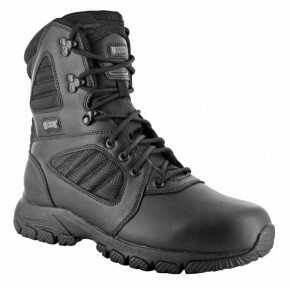 Magnum have designed the Lynx boot to be an all round modern patrol boot for everyone. They have done this in a wide range of ways that I am going to explain. The nylon of the boot is tough and is designed to be flexible but at the same time durable as well. This helps you to move your feet more freely but at the same time you know it won’t split and let you down. The nylon panels on the side are design to keep your feet cool and allow the air to get in the boot easy. This is great to make your feet more comfortable and stay at the right temperature. The Magnum Lynx boot has a Blucher lacing system which is designed to make the boots fit to your feet better. At the top you have quick on and off hook eyelets. This is to get the boots on or off quicker, which is great after a long shift. The rubber out sole of the boot is designed for high traction and maximum grip so you will not have to worry about slipping over while running. The mid sole is EVA this is designed to offer you comfort and support for your underfoot. This boot has all the right specification to be a great all round patrol boot. It is even certified to EN standard. The EN code is EN ISO 20347:2012 OB E FO SRA. Magnum Lynx 8.0 – Where can I get a pair? As the Magnum Lynx 8.0 boot is just been released by Magnum it may be hard to get hold of. I advise going to A Magnum elite stockist to get a pair. The best one I know of is Patrolstore.com. If you are interested in the Magnum Lynx 8.0 boot go there.